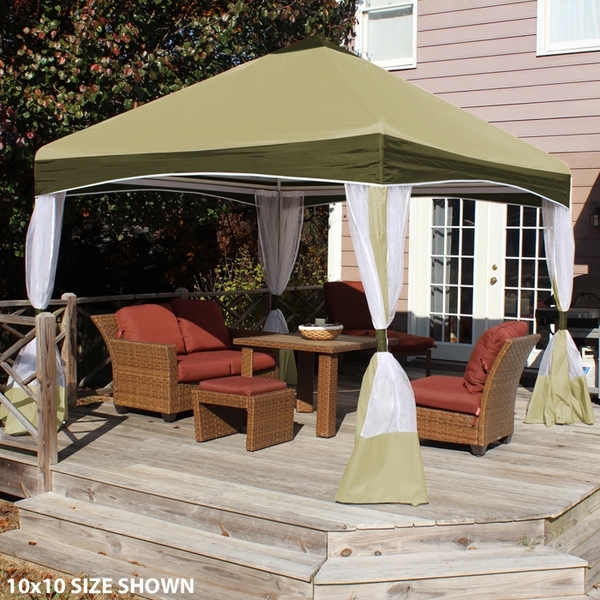 The Garden Party canopy provides ample shading for dining, parties, or relaxation. It features 100% polyester construction for a more formal look. Zipped up, the screened sides keep the mosquitoes at bay; tied back, they let guests move freely. An attractive and versatile addition to any yard or patio. Who is the manufacturer for just the canopy, no frame? The manufacturer for the canopy and the frame is King Canopy. I read a question that stated that the the frame/ legs are not like a pop up. Are the legs metal? I see one white image of a leg with holes. That leg looks plastic. Is it? This frame is made of white powder coated steel. You can view the poles in the manual located here. 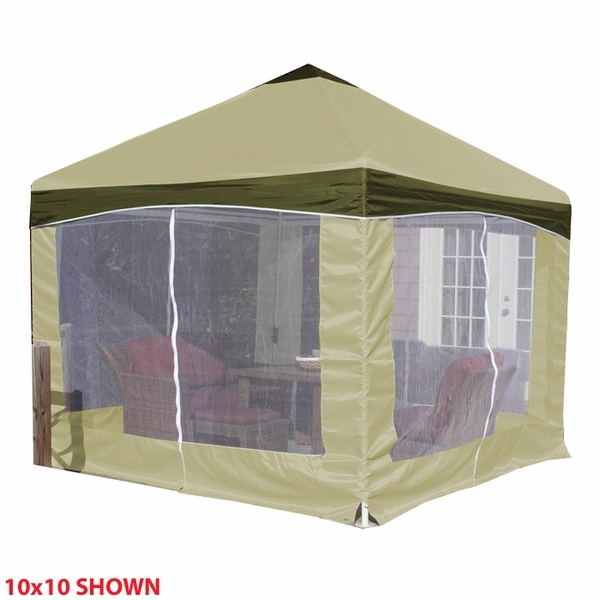 Can I purchase the canopy separately? We do not carry the 13' x 13' replacement canopy. I would suggest contacting the manufacturer. I am trying to fit this onto my Lowes pontoon boat. My outside rail to rail dimensions are 8' 6" W X 13' L. Will it fit? This item will be 13' wide by 13' long. Therefore, it will not work for you. Is this tent easy to set up or have a bunch of parts to put together. 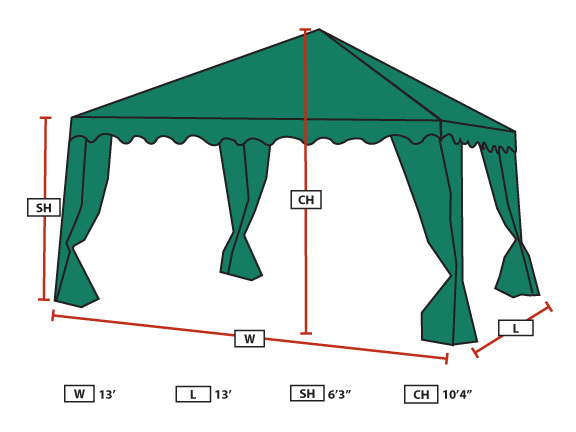 The Garden Party Canopy Gazebo - 13 X 13 - Green has a pole kit so the frame is not a pop up style frame. How heavy is the frame of this Garden Party canopy gazebo? This frame weighs approximately 65 pounds. Can this canopy be used at the beach? I am looking for a durable but roomy space for a family vacation but I was not sure if it would be possible to anchor this into the sand. This would be very difficult to stake down into sand. If you wish to use it at the beach, we would recommend you use water barrels or cinder blocks to tie the legs down to provide sufficient weight. What is the warranty? Does it cover wind damage? The warranty is for 1 year and it is only for manufacturers defects. I am looking for a more "permanent" structure to set up in my fenced in back yard. Is this gazebo the best for this installation? Does the 3M Scotchguard treatment make the fabric water resistant or water proof, or was it applied for another reason? The Scotchguard treatment is dual purpose. It is designed to prevent staining of the fabric and also is designed to increase water resistance. The fabric is not waterproof, but will stand up to some moisture accumulation. I have a few questions. My son's birthday is coming up in about 20 days and I was wondering what the true difference was between a tent and a gazebo or a canopy? In addition, I was wondering whether I could fit four tables that were 6ft long each under this Green Party Canopy. I wanted to place them in a way that they would form a square, and I believe it will fit, but wanted to make sure. A canopy usually refers to the type of canopy that folds and unfolds with the only assembly required is attaching the canopy top and walls. A gazebo requires the frame to be assembled and is a more steady structure than the canopy and offers more rain protection. A tent usually refers to an actual tent like you would see a circus held in. These are waterproof and also require assembly of the frame. Regarding the tables, we would need also need to know the width of the tables to ensure we give you the correct advice on whether they would fit. What is the actual footprint size of this ? Is it 13x13 or 12.5x 12.5 ? It is 13 foot x 13 foot. I love the canopy. It is elegant and a perfect size for our side yard. Our neighbors have complemented it. We could not close the zipper of side walls. It has been up for 3 weeks and has already taken two hard rains in southern Louisiana. ConsCould not close the last if the four zippers on walls Might be our error when setting up the frame. We love this so much and put it to good use over the spring. We added some duct tape around the poles in the roof structure, because they kept falling out while we were trying to install it. One time, some of the pieces actually fell on us! Another problem was that the instructions were a little confusing for us to follow. I really missed having some shade trees to read under after we moved recently and didn't think this tent would help much with my problem. I was pleasantly surprised that it is working out as well as it is! I've had it outside for a many months now and it is still holding up and letting me read my books in the cool shade. We had lots of help putting it up and had it ready to use in about an hour. It is very well made and seems to be sturdy enough to withstand the test of time. I really recommend getting this product, especially since the price is so great! I got a lot of value out of our last canopy like this one. We had it up for three summers near our pool and it did a great job, with only a little fading from the sun over that time. We kept it up in all kinds of summer weather and it really lasted well. I'm going to keep buying these until they stop making them! I loved this Canopy from when I purchased my first on 5 yrs ago up to last month when a storm lifted it off the deck and put it in a tree!!! I immediately searched it out and bought my second one.... and would buy it again!!! Roomy excellent in rainy conditions... Well worth the money!! We used this canopy over the July Fourth Weekend and it worked out great for our barbecue! Assembly was fast with a partner and we were done in about 20 minutes. This is a great tent that we use from the end of spring to the beginning of fall and it really stands up well to the weather. It has faced rain and high winds with little to no leaking. The bug skirt helps keep the bugs out, which is great! Assembly wasn't too bad, but I needed to have a little help in some areas. There are so many things to like about this canopy! I love the size of it and the fact that King Canopy also sells replacement tops in case the original ever wears out. It helps to know that I won't have wasted my money if there is any damage that comes to the top. I think it really does a good job of keeping the bugs out and I used it in North Florida. I think the only real flaw with this comes in the installation, but once you get it up, it works great. About installation, I would really recommend putting it together with at least one other person. It would really help if there were some way to color code the pieces to help you find them easier. I ended up using 10 foot racheting tie down straps and they seem to do a good job keeping this canopy stationary. I used shower curtain hooks on the screen, so that really helped also. Despite those minor issues, I really expect to get good value out of this canopy. This is a great canopy that has worked well for us the few times we've used it for some large parties. Unfortunately, it does get quite hot under the canopy, so if this had a vent it would be so much better. We ended up using our own fans to help get some air circulated under the tent. 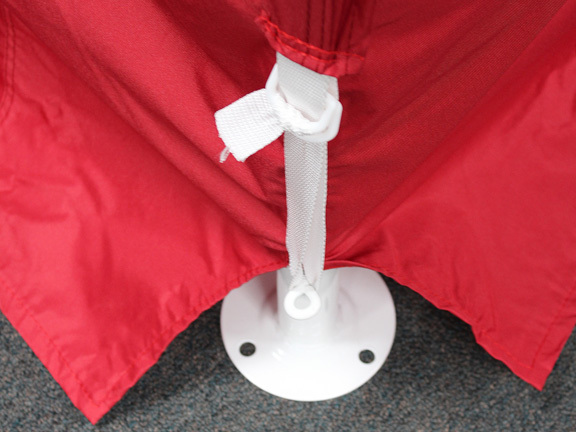 I do like the durability of the tent and the size and weight make it very stable, even without anchoring. Two people were needed to put this together, but we got it put up and ready to use in only about 30-45 minutes. I'm not sure about the bug screen, as we haven't used it yet. The appearance of this canopy is very nice - plenty of room for table, chairs, etc. The screens only lasted 2 years, however, then ripped. I kept it up all summer on my wood deck in all day sun. Green color bleached somewhat - still liked it overall and am trying to get a replacement cover. We love this, but we had a really bad experience with the shipping process. When we received it, the packaging was all messed up. There were no major problems, but there could have been. We are using this for our business and are really pleased with how things have turned out. We got it to use to sell things out of and it really stands up well to the elements. It is a little challenging to put up, so it really helps to not do it alone. Doing it with 2-3 others would be best. I really love this canopy and think it is very sturdy and solid. The screen zippers are easy to slide on their track and makes it easy to use. The only problem was with the poles being very hard to keep together. We ended up using duct tape to keep them in place, which might be a problem for some people if they have to put it up and take it down a lot. We left it up all season, though. Also, there are some small pinholes in the fabric that can let some moisture in during a heavy rainstorm.